The importance and role of pre-/in-service inspection(PSI/ISI) for nuclear power plant(NPP) components are intimately related to plant design, safety, reliability, operation, etc. In this paper, for an effective and efficient management of large amounts of PSI/ISI data in NPPs, an intelligent database program(WS-IDPIN) for PSI/ISI data management of NPP was developed. WS-IDPIN program enables the prompt extraction of previously conducted PSI/ISI conditions and results so that the time-consuming data management, painstaking data processing and analysis in the past are avoided. Furthermore, development of 1) statistical reliability assessment program of PSI/ISI results based on ASME Code Sec. XI Appendix VIII, 2) standardization of ISI UT record form and 3) ISI UT auto flaw evaluation and acceptance program were presented. Nuclear power plant consists of various components such as reactor pressure vessel(RPV), steam generator(S/G), pressurizer(PRZ), turbine, reactor coolant pump(RCP) and piping. Throughout the world, most nuclear power plants, as well as chemical and petroleum plants have been in operation beyond their original design lives of 30 to 40 years. Nondestructive evaluation(NDE) techniques for characterizing important mechanical and material conditions, such as structural support integrity and pressure boundary defects at weld location in NPPs, have been developed and implemented through various initiatives. It is well known that ISI plays an important role to assure the integrity of a structure or component of NPPs. The inspections of components in NPPs are carried out by two-step approaches: The PSI/ISI depending on whether the inspection is performed at the completion of plant construction or during the plant operation. The objective of PSI to confirm that all structural members of the plant have been safely and properly constructed, and to provide a comparative data which are compared with the future ISI results. The PSI and ISI in Korean NPPs are performed according to ASME code Section XI[2-4] "Rules for In-service Inspection of NPP Components" and CAN/CSA-N 285.4. These activities include the ASME Code Sec. XI and CAN/CSA-N 285.4 requirements, the Nuclear Regulatory Commission(NRC), legislative requirements, and other specific initiatives. The ISI of nuclear components is generally performed in 10-year period during the plant operation. Because the ASME code mandates that PSI/ISI be performed by NDE. In Korea, during the past decade a large amount of PSI/ISI data have been filed up, but they could not be systematically assessed. Recently, Korea Institute of Nuclear Safety(KINS), being in charge of nuclear safety in Korea, was deeply interested in set-up of database for PSI/ISI results to be able to make sure if all the defects disclosed throughout inspection are being managed in a right way and to get an effective and efficient management of large amounts of PSI/ISI data in NPPs. In this paper, for an effective and efficient management of large amounts of PSI/ISI data in NPPs, an intelligent database program(WS-IDPIN) for PSI/ISI data management of NPP was developed. WS-IDPIN program enables the prompt extraction of previously conducted PSI/ISI conditions and results so that the time-consuming data management, painstaking data processing and analysis in the past are avoided. Furthermore, development of 1) statistical reliability assessment program of PSI/ISI results based on ASME Code Sec. XI Appendix VIII, 2) standardization of ISI UT record form and 3) ISI UT auto flaw evaluation and acceptance program were presented. Fig. 1 shows the main screen of intelligent database program developed in this study. An intelligent data base program based on Delphi 3.0 + Visual Basic 5.0 has been constructed under fully compatible with Windows 95 for the continuous upgrade version and the effective interface with users. The main menu of the WS-IDPIN program are configured with units, documents (CAN/CSA and ASME Code, execution details of the inspection, customer notification form(CNF)), reliability module, ISI UT auto flaw evaluation module, UT inspection record sheet module, and a function of help. A number of toolbars serve as a foundation for the higher levels such as libraries for convenient access to the database; provide interactive and automated PSI/ISI data set. This software may be used in various computer languages such as Hangul word processor and MS-Office(Word, Excel, PowerPoint and Access). The Pentium PC was used to build an intelligent database program. Fig. 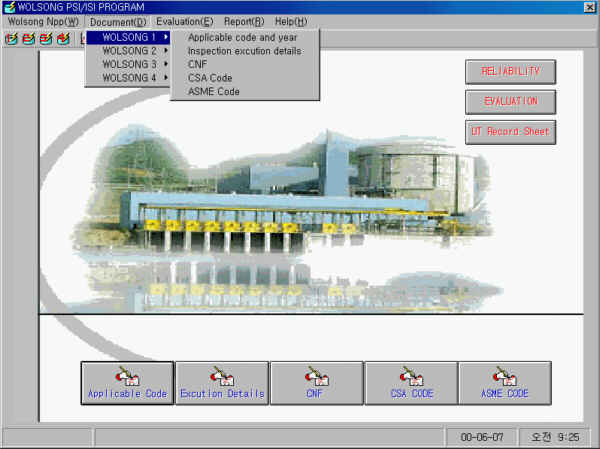 2 shows the initial screen image where we can pick up all the related information, where applicable code and associated addition/addenda, inspection execution details, customer notification form(CNF), and ASME code Sec. XI requirements can be shown for common work management. The database form of NDE results carried out during PSI/ISI in NPPs is shown in Fig. 3. It consists of a number of data sources, for example, inspection period, inspection year, CNF, component number, NDT method, flaw type, resolution record, and detailed file. Basically MS Access is used for the construction of PSI/ISI database. This program can be sorted the arbitrary data sources included in this database form. Using the sorted PSI/ISI data, it can be used to analyze the defects detected during PSI/ISI in the pipe and the pressure vessel of the NPPs, to investigate the NDE data inspected repetitively and the contents of treatment, and to offer the fundamental data for application of evaluation data related to fracture mechanics. Fig. 4 shows an example of the sorted PSI/ISI data. Fig. 5 and Fig. 6 present edit window for new data input. Statistics of NDE results can be processed, using performance demonstration data on the basis of ASME Code Sec.XI Appendix VIII in the section of reliability analysis module. In Figure 1, a double click on the button RELIABILITY opens the window of reliability analysis program. A click on the button SIZING will operate the analysis program that in turn calls out the statistical parameter after actual data and measure data are inputted. Here, it is possible to analyze the results of the piping inspection round robin(PIRR) test such as depth and length sizing performance, probability of detection(POD) performance, relative operating characteristic(ROC) performance, false call performance etc. For ISI UT examination where the surfaces are flat and parallel, the through thickness measurements can be calculated from simple trigonometric equations. For a cylindrical and spherical shape, the equations may be quite rigorous, especially where the beam path is desired in a direction other than axially or circumferentially. This beam path is a function of the inner and outer diameters of the cylinder or sphere, the ultrasonic beam angle and the clock position of the beam scan angle(azimuthal angle). In the process of this work, several equations have been evaluated to determine their accuracy in predicting the through thickness beam path. Equations involving the use of ellipses to calculate beam paths and flaw bounding parameters were most successful. Equations were formulated and computer programs were developed. The discontinuity through thickness information is calculated from the input of vessel or pipe information(diameter), ultrasonic beam angle, scan direction angle with the cylinder axis and beam path information taken from the reflector in the ultrasonic examination. This WS-IDPIN provides PSI/ISI UT auto flaw evaluation and acceptance module. On clicking the button EVALUATION, the initial window will be opened as seen on Figure 7. The program require the input of the following information about the cylinder and the ultrasonic beam and scan parameter: 1) inside diameter(ID), 2) outside diameter(OD), 3) ultrasonic beam angle, 4) angle of scan plane with cylinder axis, 5) beam path to the top of reflector(W1), 6) beam path to the bottom of reflector(W2). After that, a click on the button EVALUATION leads to an input window that requires the indication length(l) and acceptance standard (a/t)allowable. On inputting the indication length(l = 0.5) and acceptance standard (6.5), the result of parameter S1=2.80, S2=1.50, 2d=0.60, aspect ratio(a/l)=0.5, allowable aspect ratio=6.1%, and "Indication is acceptable" will appear on the result window. The program can be used for any angle beam examination from flat plate to spherical shapes as selected by the proper azimuthal angle. ISI UT auto flaw evaluation and acceptance program were presented. ISI UT auto flaw evaluation and acceptance program can be used for any angle beam examination from flat plate to spherical shapes as selected by the proper azimuthal angle. Besides, this program can be further developed as a unique PSI/ISI data management expert system. ASME Boiler & Pressure Vessel Code, Sec. XI, Rules for Inservice Inspection of Nuclear power Plant Components. Appendix VIII of ASME B & PV Code Sec. XI, Performance Demonstration for Ultrasonic Examination System.